The internet is really a very powerful tool. It allows us to call up information on a wide range of subjects with very little effort. The speed at which things occur online urges us to give immediate voice to our thoughts. Now, our emotional sides simply love this arrangement. They get to dictate our reactions more frequently when we can just type a few words and click a button before the rational sides of our brains have a chance to say, "Perhaps you should pause to reflect a moment." When you decide to comment on something online, it's a good idea, therefore, to stop a minute to consider what you plan on saying. Start by asking yourself if you actually know enough about the topic upon which you're commenting to, at the very least, avoid saying something incredibly inane. Taking this time to think things through also gives you the opportunity to consider whether your words might be insulting or insensitive to others who are personally affected by the subject. If you do find yourself leaving callous remarks like this individual in the comments section of an article in a widely read newspaper, you might end up finding yourself the target of some justified and well-reasoned criticism like this, this or this. After reading something like this, you might feel a sense of shame, perhaps even embarrassment. After all, someone has just shown that you were out of your depth on not just one, but two subjects. And all of your friends have witnessed it. You may ponder deleting that comment; simply erase the loss of face and send things down the memory hole. You will only invite further criticism that you are afraid to have an honest discussion, that you censor reasonable questions. In short, you add to your image as a shameless, callous, insulting individual the added bit of being a coward. When you say stuff like that, you just look even more foolish when evidence that those words you're denying actually did flow from your fingers. Chalk up "liar" to the list of epithets that describe you, should you pursue this course of action. 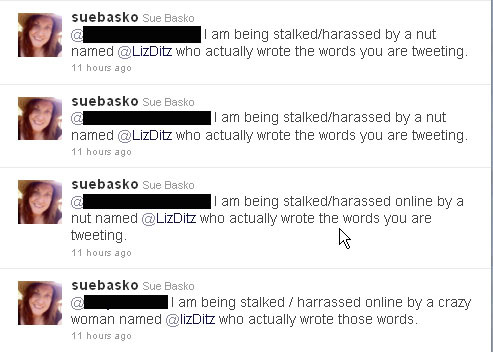 You see, accusing someone of crimes (e.g., stalking and harassing) and sending that message in separate tweets to everyone (or at least a large number, I got tired of getting screen shots after the first 100 separate, distinct tweets that were sent - anarchic_teapot has a storify post with a more complete capture of her tweet stream) who follows your critic on Twitter is what defamation lawyers might consider a bad move. That is acting with the deliberate intent of spreading false statements of fact that damage the image of the target. This behavior is what is called libel. If your target so chooses, they would have a very reasonable case against you, should they decide to pursue a legal suit. And tweeting that you have reported your critic to the police for stalking/harassment, when they have not done so, is also not a good idea. At best, you're probably just bluffing, in which case you look like a fool. At worst, if you aren't bluffing and really did file a police report, you may find that you are running afoul of certain laws about filing false police reports (see also 18 USC 1001 - h/t to Squillo). #3 - Don't deny you said what you said. #4 - Don't libel your critics. If you follow these rules, you should be able to avoid a great deal of headache, ridicule and embarrassment later. This has been a public service announcement from Harpocrates Speaks. You win at the internet today. GOOD STUFF! This woman, in addition to the tweets you show, sent me (and I'm sure others) an email about how she writes a blog for an autistic man who is in jail. I think she is, at best, grabbing for attention. At worst, she is delusional and frightening. Thank you for pulling this all together. 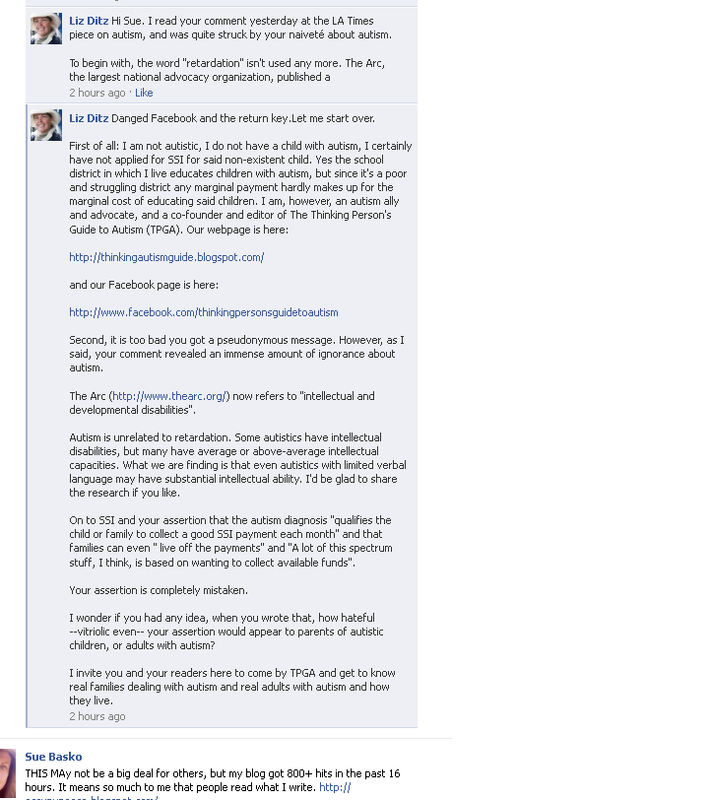 The other rule of the internet: never piss off the parents of special needs kids. This is all very good advice. Some of which I have tried to employ, including not letting comments from strangers on the Internets bother me. I hope that Ms. Basko's family takes notice and tries to get her the help she needs. This is not normal behavior, and it may not have been her behavior even a few weeks ago. very carefully, looking for anything having to do with parents being entitled to SSI once their child is diagnosed with autism, which is the claim the woman refernced abouve was making. Zarembo didn't make that claim. He doesn't mention SSI benefits at all. In fact, I couldn't find a reference to a quote from Autism Speaks. Astounding the lengths some people will go to, to refuse to be accountable for their own actions. Deletions, denial, and libel, oh my! Oh dear! This reminds me of the way *you all* react to any mention of cannabis science. Especially cannabis for autism science. Cannabis causes low birth weight? Not according to the other 3 (better designed) studies!! I have told you before, you are welcome to post here as long as you stay on topic. If you spam my posts with off-topic comments about your cannabis fixation, those posts will be marked as spam. I thank you for this. I see alot of people going into blogs or news sites about music artists I enjoy. They are regulars of said sites and believe they have a right to criticize the artist. When a fan of that artist starts to contradict them then they criticize the fan. It's not right if your not a fan of a music artist keep your mouth shut and let the fans who are following that artist say their comments without being ridiculed. Man this makes my blood boil. I am a registered psychologist that works with families of children with disabilites and you know what Sue – they are regularly reduced to tears of frustration at the blatant discrimination and just plain narrow mindedness of people like you! The arrogance of people who think they know the lives, pain, struggles, achievements of other families not like theirs is intolerable. I read both, was contacted by sue and told I was wrong, like many of you. I appologized for any harm I may have done, but that I didn't fully believe her, but was going to stay out of it but told her WHOEVER wrote the comments was very hurtful and needed to be educated on the realities of having an autistic child and the costs that go along with it. She then blocked me. 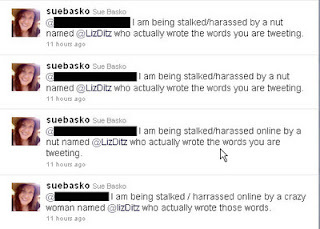 As the article above from the other known victim of Liz Ditz states, she does these thing to get attention and to draw readers to her blogs. I cannot comment much more due to ongoing investigation. Sorry to anyone who is legit and to whom I did not respond. I have been overwhelmed with an onslaught attack of cyberstalking against me. I have been TOLD by law enforcement to block after recording the names and URLS of each person contributing to the cyberbullying attack. You may not feel like what you are doing is wrong, but it is illegal. The crime is called Cyberstalking. Let me be very clear: Liz Ditz is a liar, and a person who is so devoid of decency as to lie about matters which cause children’s lives to be put in danger. She did this to draw traffic to her website. She was successful in getting this money and audience, at the expenses of our volunteer rescue team’s ability to save lives. Her selfish obsession with money and attention, ‘at any cost’, is NOT acceptable to decent people. There should be Internet laws that would put someone like Liz Ditz, in prison. Her website is full of wild crazy rants and bouts of hatred. She is like the ‘little man hiding behind the curtain with a giant megaphone, in the Wizard of OZ. Her actions would be pathetic if they hadn’t caused the loss of so much life and undo suffering of so many innocent victims. It has taken 6 years of brutal abuse, via her vitriolic and hateful Internet rants for us to be able to ‘track her down’. She successfully hid behind her computer. She is not only one of these ‘creatures’ who use the Internet with impunity to destroy the lives of people with their hatred. She is a bold faced liar of the worst kind. Based upon her 6 years of harm to our rescue team; I believe that Liz Ditz would do anything for money and attention.Now that we have ‘tracked her down’ we consider it to be our duty, as decent people, to expose her nefarious activities to the ‘light of day’. We found her phone number and can you imagine that she is on the Board of Directors of a Private Girl’s School. Absolutely stunning! Ms. Basco, I urge you to seek some help immediately. This course you are on is rather self-destructive. The people that you are stalking (yes, YOU are the one doing the stalking) have either personally known or have been acquainted with Ms. Ditz for years. Her reputation as an autism advocate is well-known in wide circles. Your reputation as an internet psycho is also becoming well-known. 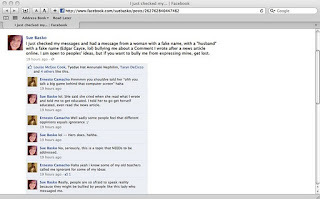 The lawyer woman is referring to a series of posts I wrote, starting in 2004. The person she quotes has been covered by Snopes, covering the same material I referenced in my posts. And THEY just found you Liz, hiding out in plain sight all this time. I guess lawyer lady doesn't have much of a career if she has the time to stalk your acquaintances and consort with other paranoid fraudsters. Ms. Basko, please locate your nearest mental health clinic as soon as possible. You seem to be having a break down, one that can seriously impact your career. Her posts are filled with vitriol and all caps typing. Who looks more like a person who would stalk another person? Either this person is dealing with delusions or she is doing damage control for her reputation as a Hollywood lawyer. That's an odd sort of damage control. I feel sorry for her clients. I've been too busy to follow Twitter for the past few weeks (successful new Etsy business Xmas crunch) but I may have received some of that stalker spam too. Good luck dealing with this. Reminds me of the whole Markuze/PZ Myers thing. Ms. Basko, if you are taking the time to read this comment, I have a few questions for you. 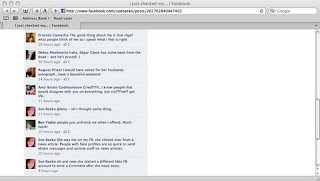 Are you claiming that Ms. Ditz somehow hacked your Facebook/Twitter accounts and made those comments she took screenshots of and added to her blog? All this in an attempt to call more attention to her site? That's quite an extraordinary claim, and I would be interested in seeing your evidence of this. 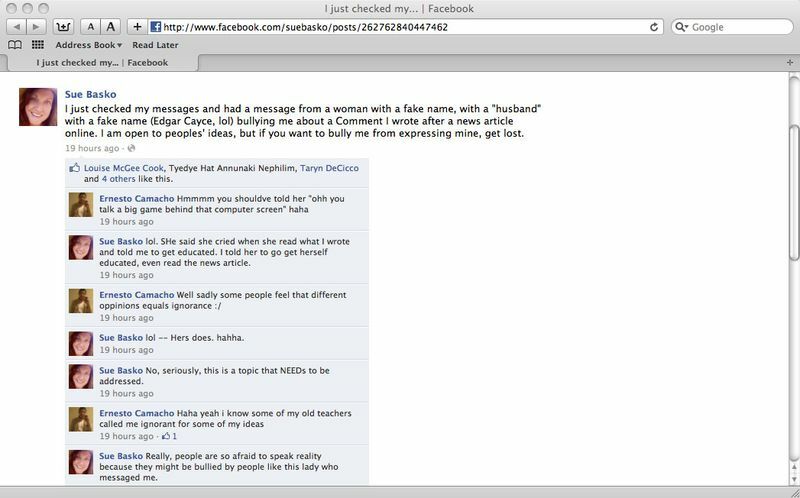 Secondly, if you did actually make those comments that Ms. Ditz has recorded, I'm wondering if you could assist me. You see, my son is currently diagnosed with autism. I know that, in your opinion, I likely just got him diagnosed so I can get the SSI benefits, but in reality, he's diagnosed with autism because he is 10 years old, knows less than 20 words, is still in diapers, and will require specialized care for the rest of his life. 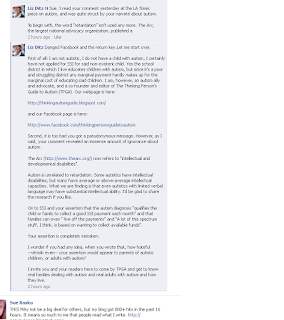 It seemed logical for me to request SSI benefits considering his extreme handicap. So, my question is this: Since I just wanted in on the "gravy train," can you point me to where I can actually benefit from this alleged scheme? Because, at the moment, I'm working two jobs to cover my son's medications, therapy, and personal needs, and I'm doing it all out of pocket because my insurance company won't pay over a certain amount, and I allegedly make too much money to receive benefits. Even though my son will require specialized care for the rest of his life. If you have this information, I would appreciate your prompt response. For Todd and Liz, I want to thank both of you for bringing attention to this. I may not agree with everything you guys say, but you have both earned a great deal of respect from me (if that means anything to you) for standing up to this outright ignorant and hateful "theory." Thanks for your support, MySocratesNote. Moments like this serve as a good reminder that we're all working toward the same goal: the health, support and quality of life of autistic individuals, whether children or adults. Thank you, MySocrates Note, and YES, your respect means a lot to me, just because we disagree on some things. As Todd says, we're working toward the same goals: "the health, support and quality of life of autistic individuals, whether children or adults." I am not an attorney--not even a Lawyer for Music and Film--but I as a writer, I am quite interested in and reasonably informed about both First Amendment issues and libel laws. May I suggest you review the sections on defamation in your law school textbooks? My skeptical blogging friend Calladus added to the conversation today: Internet Insanity. Short version: Ms. B- doesn't understand copyright law, either. No kiddin'. But it gave me (and my significant-attorney-other) a little chuckle. You would think that as a Lawyer for Music and Film (sorry--the moniker keeps cracking me up), advising clients on copyright issues would be a big part of what she does. But on the bright side, who knew that one could just decide that an entire legal doctrine does not apply because one said so? Guess we can just give SCOTUS their walking papers. Hang up your robes--nothing more for you to do, ladies and gents. 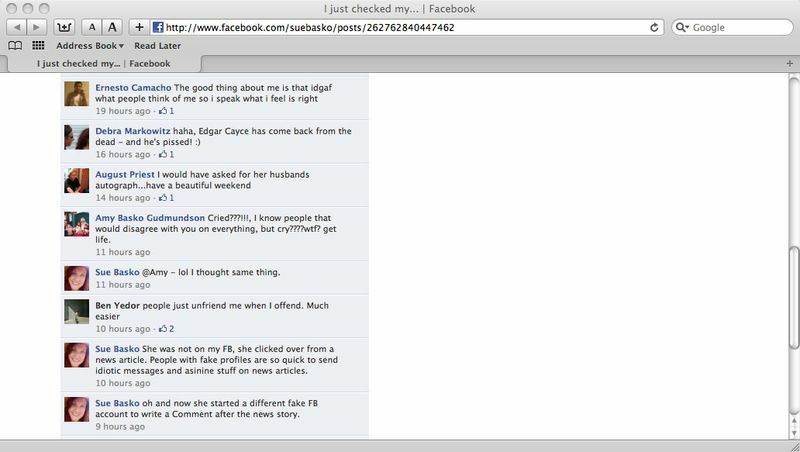 Ms. Basko also deleted all the tweets she made to Calladus. Even when deleted from timelines, tweets are still there. When you take screenshots, try to take the web address showing for that tweet. It contains the tweet ID number that can be accessed through Google cache for quite a while.